This system operates when you are backing the vehicle. It uses corner and back sensors to detect an obstacle and sounds a buzzer to inform you of the approximate distance to the obstacle. ● The reversing sensor system assists you in determining the approximate distance between the vehicle and an obstacle located behind the vehicle. It has limitations in terms of detectable areas and objects, and may not properly detect some objects. Therefore, do not place excessive confidence in the reversing sensor system, and operate the vehicle as carefully as you would a vehicle without this system. ● Make sure to check the surroundings with your own eyes to ensure safety. 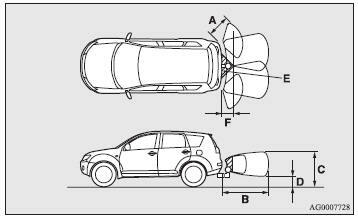 Do not operate the vehicle by relying on the reversing sensor system alone. The detection areas of the corner and back sensors are limited to those shown in the illustration. Moreover, the sensors are unable to detect low or thin objects or objects near the rear bumper. Thus, make sure to check the surroundings as you operate the vehicle in a safe manner. There are two corner sensors (A) at the corners of the rear bumper, and two back sensors (B) in the centre of the rear bumper. Depending on whether the vehicle is equipped with a towbar, you can change the reversing sensor system between the standard mode and the towbar mode. The towbar mode changes the system to exclude the area in which the towbar is mounted from the detection areas. The detection areas are within approximately 60 cm (A) from the corner sensors, 150 cm (B) from the back sensors, and 60 cm (C) or less from the ground surface, excluding the area approximately 10 cm (D) from the ground surface. The detection areas are within approximately 60 cm (A) from the corner sensors, 150 cm (B) from the back sensors, and 60 cm (C) or less from the ground surface, excluding the area approximately 10 cm (D) from the ground surface. The nondetection areas (E) are within approximately 20 cm (F) from the bumper. ● If the rear bumper has been exposed to an impact, the corner or back sensors may fail and prevent the system from functioning properly. Have the vehicle inspected at a MITSUBISHI MOTORS Authorised Service Point. ● The sensors do not detect objects located in the area directly below or near the bumper. If the height of an object is lower than the mounted position of the corner or back sensors, the sensors may not continue detecting it even if they detected it initially. For information on how to change the detection areas, please refer to “Changing the detection areas” on page 4-52. ● The reversing sensor system may not operate properly under the following conditions: • The sensors or surroundings are covered with ice, snow, or mud. • The sensors are frozen. • The system receives ultrasonic noise from other sources (the horns of other vehicles, motorcycle engines, brakes, radios, pouring rain, splashing water, tyre chains, etc.). • The sensors are extremely hot or cold (while the vehicle is parked for a long period of time under a blazing sun or in cold weather). • The vehicle tilts significantly. • The vehicle is driven on a rough road (with a bumpy, gravel, hilly, or grassy surface). • The vehicle is too close to an obstacle. • The sensors or surroundings have been wiped by hand, or stickers or accessories have been attached. ● The reversing sensor system may not properly detect the following: • Objects that are thin, such as wire nets or ropes. • Objects that absorb sound waves, such as snow. • Objects that are shaped with a sharp angle. • Objects with a smooth surface, such as glass. • Objects that are low, such as kerbstones. ● The buzzer may sound lower than the normal warning sound when the reversing sensor system is receiving ultrasonic noise from other sources, but this is not a malfunction. The buzzer will stop sounding and the system will return to normal operation after the noise is no longer received. To operate the system, move the gearshift lever to the “R” (Reverse) position while the ignition switch is in the “ON” position. To stop the operation, push the “SONAR” switch. ● Only when the gearshift lever is in the “R” (Reverse) position, the reversing sensor system can be operated or be stopped by using the “SONAR” switch. The reversing sensor system operation indicator lamp (A) will turn off that the system has stopped operating. It will flash in case there is a malfunction in the system. For details, refer to “Reversing sensor system operation indicator lamp” on page 4-52. To return the system to the operating state, push the “SONAR” switch again. When the system returns to the operating state, the buzzer sounds once and the indicator lamp illuminates. ● The reversing sensor system operation indicator lamp flashes once when the ignition switch is turned to the “ON” position. The warning buzzer sounds when the system detects an obstacle during operation. ● After pushing the “SONAR” switch, reversing sensor system operation differs according to the detection area setting. • Setting when towbar is not equipped When the gearshift lever is moved to the “R” (Reverse) position, the reversing sensor system will operate even if corner sensor operation was stopped by pushing the “SONAR” switch. • Setting when towbar is equipped When reversing sensor system operation was stopped by pushing the “SONAR” switch, the reversing sensor system will not operate until the engine has been stopped even if the gearshift lever is moved to the “R” (Reverse) position. To resume reversing sensor system operation, push the “SONAR” switch or stop and restart the engine, and then move the gearshift lever to the “R” (Reverse) position. If there is an obstacle behind the vehicle, a warning buzzer sounds to indicate the distance between the vehicle and the obstacle. ● The distances given are to be used for reference only, as errors may be caused by various factors, such as temperature, humidity, or the shape of the obstacles. While the operation of the system is stopped at the “SONAR” switch, push the “SONAR” switch approximately 3 seconds or more, and release it. The buzzer sounds twice to indicate that the detection area has been changed. While the operation of the system is stopped at the “SONAR” switch, push the “SONAR” switch approximately 3 seconds or more, and release it. The buzzer sounds once to indicate that the detection area has been changed. ● The detection area will not change if you keep the “SONAR” switch pushed for 10 seconds or more. In case there is a malfunction in the reversing sensor system, the reversing sensor system operation indicator lamp will blink and the warning buzzer will sound for approximately 5 seconds. Even after the buzzer has stopped sounding, the indicator lamp will continue blinking until the system reverts to the normal state. Have the vehicle inspected at a MITSUBISHI MOTORS Authorised Service Point.